Are you looking for information on selling your house in Carrollton, Texas before relocating to another area? It can be a confusing process when you need to sell your house as quickly as possible. Moving to a new location is a big step. You’ve researched the area, perhaps secured new employment, and you have everything ready, except that you’re not sure where to start in selling your home. In this post, we will take a look at ways to find buyers, show your house to potential buyers, give you tips on how to connect to the right people to close the deal, and suggest ways to ensure that the transition is a smooth one. Look at the real estate ads. To find the most eager buyers, look in the real estate ads. People take out ads in the real estate section to sell or buy a home. You are likely to find a number of potential buyers by checking the real estate section. One way you can do this is to look at the home listings. Then see if you can get the information for those who are selling the house. The people who are selling a house could be in the market for another house in your area. Check the classifieds. Some people who are looking to buy may list their ad in the classified section. Usually, these ads would start with the term, “Wanted,” which would be succeeded by the kind of house they are looking for. If you find someone who seems to be looking for a home like yours, give them a call to see if you can work out a deal. Check social media and real estate sites. Social media has become a mecca for sharing deals and ideas for shopping, from cosmetic bags to houses. You may be able to tap into your market by posting a picture of your house on social media and seeing if you get any bites. 1. Do some cleaning, dusting, and vacuuming before you invite people in to view your house so that it will be in the best possible shape to show visitors. 2. Detach from “stuff” such as family photographs, personal items, and individual things that define your home as yours. 3. Avoid distracting clutter. When you are cleaning your house, make sure you clear it of any distracting clutter that can draw the visitor’s eye from the focus of the room. The room should be the focus, not the extemporaneous items that you have lying around. Sometimes you assume you are closing the deal. But in reality, the deal is never really closed until the person signs a contract or hands you a check. Never use the assumptive close unless you are absolutely sure the person is ready to buy. Being presumptuous that you have convinced the person to purchase your home may negate the deal or make you appear desperate. One of the mistakes that sales people often make is that they fail to answer objections to the customer’s satisfaction. Answer only the questions they ask. But if you think you are getting close to closing, ask them if they have any other questions. Then answer honestly and to the best of your ability. If you need help selling your house quickly when you are relocating, give us a call at (214) 329-4444. We may be able to offer you some suggestions that you need to close that deal. 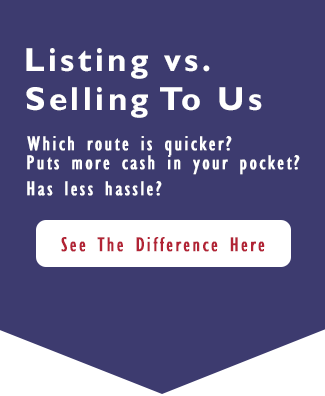 We can make it easier for you to sell your house when relocating in Texas. CALL US AT (214) 329-4444 OR FILL OUT OUR ONLINE CONTACT FORM TODAY TO LEARN MORE! Why Won’t My House Sell In Carrollton? I Inherited a House, What To Do? – Should I rent or sell in Carrollton? Help, I’m behind in my mortgage payments in Carrollton!